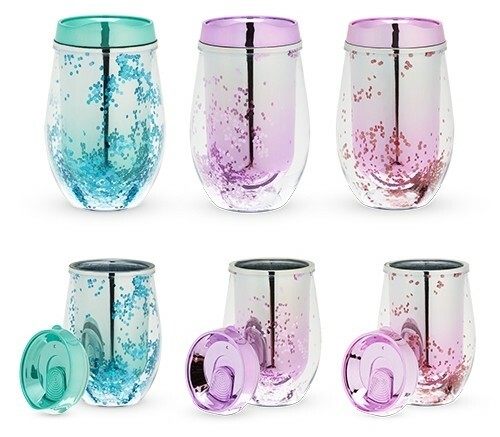 Sparkles make everything better, and these Mermaid-themed twinkling stemless wine tumblers are guaranteed to bring out your inner magic. Grab your glitterati gals and take your best shot. Made of BPA-free plastic with a colorful lid and coordinating floating glitter in-between the double-walls of the tumbler. Holds 10 fluid ounces. PLEASE NOTE: Sold individually (NOT as a trio). You may specify a preference for the color of the tumbler you will receive but the selection is RANDOM and is made at the time of order processing. If you order in a multiple of three (3), you will receive one of each color (unless you specify otherwise).